What he does: Prior to retiring last year, Li Ka-Shing was chairman of CK Hutchison Holdings and Hutchison Whampoa for decades. Not one to forget his humble roots, Li is a dedicated philanthropist and set up the Li Ka Shing Foundation in 1980. What he does: Lee Shau-kee is the founder, chairman and managing director of Henderson Land Development, chairman of The Hong Kong and China Gas Company, vice-chairman of Sun Hung Kai Properties and a non-executive director of Hong Kong Ferry Holdings. What he does: Lui Che-woo is founder, chairman and managing director of the K Wah Group, and chairman of Galaxy Entertainment Group. He also launched the LUI Che-woo Prize for World Civilisation in 2015. What he does: The former head of Wheelock & Company and its principal subsidiary, The Wharf Holdings, Peter Woo is the visionary behind the epic transformation of the iconic Murray Building, which he brilliantly transformed into a stunning five-star hotel, The Murray, Hong Kong. What he does: A Yale graduate, Joseph Tsai is the co-founder and executive vice-chairman of the Alibaba Group and its second largest individual shareholder. What he does: Non-executive chairman and a shareholder of The Hongkong and Shanghai Hotels (owner of The Peninsula Hotels group), Michael Kadoorie is also chairman of CLP Holdings and oversees the Kadoorie Group. What he does: Robert Miller is the co-founder of duty-free retail behemoth DFS and sailing champion who won the Rolex Transatlantic Challenge in 2005, beating a century-old record. What she does: Pansy Ho is group executive chairman and managing director of Shun Tak Holdings, and co-chairperson and executive director of MGM China Holdings. 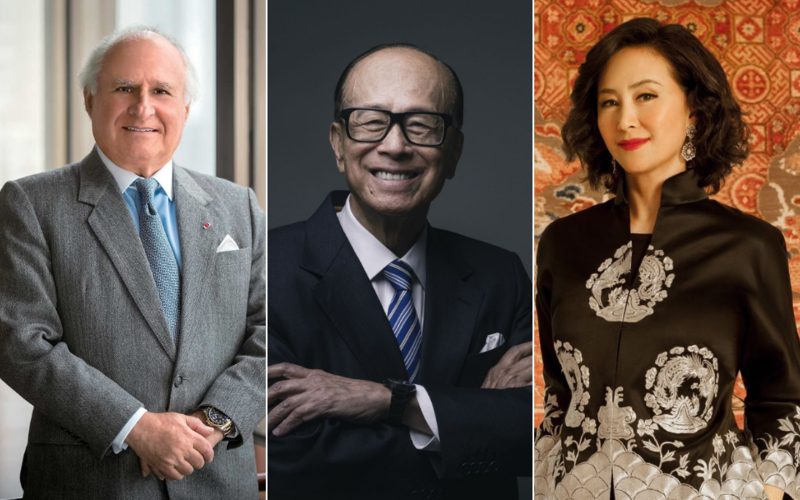 What he does: The son of Li Ka-Shing, Richard Li is chairman of PCCW, Pacific Century Premium Developments and Pacific Century Regional Developments, chairman and CEO of Pacific Century Group, and executive chairman of HKT and HKT Management. What she does: Rita Liu is the co-founder—with her late husband, Thomas Liu Lit-ching—and chairman of Gale Well Group, which has a vast Hong Kong property portfolio. She has been involved with charities for more than 30 years, including APA, Caritas, Yan Chai Hospital, Red Cross and HKU’s medical school. Robert Miller Co-founder of duty-free shopping giant DFS; sailing champion; trustee and donor of Asia Society. Rita Liu Co-founder and chairman of Gale Well Group; long-time supporter of numerous charities. Richard Li Chairman of PCCW, Pacific Century Premium Developments and Pacific Century Regional.